The federal government is pushing for more bike lanes on America’s roads in a new initiative designed to increase the amount of people who walk and bike as their main method of transportation. The Department of Transportation (DOT) released an action plan last week, detailing its plans to give local communities "road diets," or turning driving lanes into bike lanes and pedestrian crossings. "The new pedestrian and bicycle safety initiative will promote design improvements to ensure safe and efficient routes for pedestrians and bicycles, promote behavioral safety, and provide education to help individuals make safer travel choices," the agency announced in a press release. "Among the many resources the Department will provide will be a guide to creating ‘road diets,’ in which roadways with lower traffic volumes are redesigned to add space for bicycle riders and pedestrians," they said. " Studies show that road diets reduce all traffic crashes by an average of 29 percent, and when used on rural highways that pass through small towns, they can reduce crashes by almost half." The announcement was accompanied by a report on how the government will increase walking and biking, calling it an issue of "equality." "Walking and biking are not just lifestyle choices," writes Secretary of Transportation Anthony Foxx at the beginning of the report. "They complete our transport system and are the first and last leg of almost every trip." "The U.S. Department of Transportation is committed to making safe walking and biking a reality for all Americans, regardless of age, income, or ability," he said. The Secretary added that walking and biking "connects people to endless possibilities." Foxx’s message is signed next to a picture of him riding a bicycle with a basket. The report notes that the agency wants more individuals to walk and bike because they are "environmentally-friendly" options. The DOT also claims that walking and biking can "expand the middle class." The initiative will promote infrastructure and design changes to roads in cities and towns, and new technology that alerts drivers of pedestrians through their smartphones. 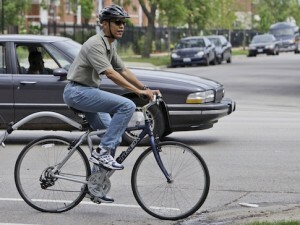 Government bureaucrats will also visit every state for on-the-ground walk and bike "safety assessments." The DOT also wants communities to develop something called "interconnected pedestrian/and or bicycle transportation facilities," which they say allows "people of all ages and abilities to safely and conveniently get where they want to go." The new campaign comes as pedestrian and biking deaths are "steadily" increasing. More than 5,000 Americans were killed biking and walking in 2012. Twenty-four percent of bicyclists were drunk at the time, while 36 percent of pedestrians had blood alcohol concentrations of .08 BAC or higher. "We must better protect people on foot and bicycle by fostering environments and multimodal transition points that are safe, so that even more Americans will feel comfortable enough to take advantage of walking and biking," the DOT said. The DOT concludes its report by stating every American should be able to bike "regardless of age, ability, or income." "The growing interest in bicycling and walking needs to be encouraged and supported through continued investment in safer infrastructure, and through new resources and tools to ensure that we choose the safest designs and promote safer behaviors," the agency said.